The general policy in New Jersey is to seek a mandatory term of parole ineligibility absent extraordinary circumstances! The Garden State’s general policy toward illegal handguns and firearms is the “promise of imprisonment”, rather than rehabilitation. This means state prison as opposed to probation, house arrest or even county jail with work release. Originally the Graves Act imposed a 3 year term state prison sentence but now the law New Jersey calls for a mandatory 42 month state prison. New Jersey amended the Graves Act in 2013 to increase the mandatory minimum term to 42 months. Despite a mandatory minimum sentence, an accused person may still seek a waiver of the mandatory minimum sentence requirement of state prison. Under NJSA 2C:43-6.2, an individual charged under the Graves Act is eligible for full waiver to a probationary term rather than a custodial sentence where the mitigating factors, as defined by NJSA 2C:44-1, substantially outweigh the aggravating factors. Even if a person isn’t eligible for a full waiver, he or she may be eligible for a partial waiver which would reduce mandatory 42 month prison sentence to a one year term. For a partial waiver, the prosecutor must only determine that the aggravating factors applicable to the offense and the offender himself do not outweigh the applicable mitigating circumstances. In a recent New Jersey Supreme Court decision (State v. Witt), however, the Court like Pennsylvania, specifically stated that “the Automobile exception to the Fourth Amendment’s warrant requirement authorizes police officer to conduct a warrantless search of a motor vehicle if it is readily mobile and the officer has probable cause to believe that the vehicle contains contraband or evidence of an offense. 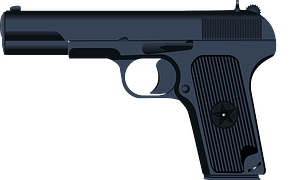 It is extremely difficult and nearly impossible to obtain a permit to carry a handgun in New Jersey as it is a “may issue” jurisdiction. Further, the applicant needs to obtain a permit to purchase a handgun or a Firearm Purchaser Identification Card. The applicant must also demonstrate “thorough familiarity” with the safe handling and use of a handgun through an approved firearms training course. If you’re charged with a gun crime in New Jersey, you are technically eligible for Pre Trial Intervention but most prosecutors will usually not agree to it.